Connect your microphones to the mixer inputs via XLR cables. We'll use the AUX Send 1 output to control the audio being sent to everyone's headphones by connecting the 1/4" to stereo mini plug from AUX Send 1 to the input on the headphone distribution amp on our show table. Finally, we'll use the stereo RCA cables to connect the Tape Out of the mixer to the audio inputs on the breakout cable for the Blackmagic Intensity Shuttle. As mentioned above, the audio will come in through the RCA breakout cables. We will connect the video camera via HDMI cable to the HDMI input on the Intensity Shuttle. Finally, use the Thunderbolt cable to connect the Intensity Shuttle to the Macbook. On the Macbook Pro, we are running Ustream Producer Pro to handle the encoding, camera switching, and any other graphics or production elements. 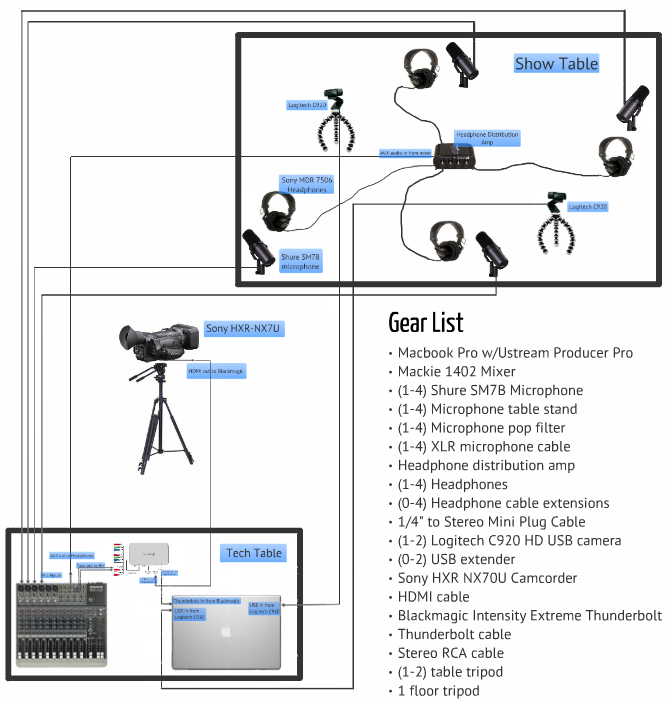 We have the audio from the mixer and the video from the HDMI camera coming in via the Thunderbolt cable and have the option to connect 1 or 2 Logitech C920 HD USB cameras. Depending how far the Logitech cameras are from the tech table, USB extenders may be required. The SM7B is a professional microphone used by many radio stations and professional recording studios. 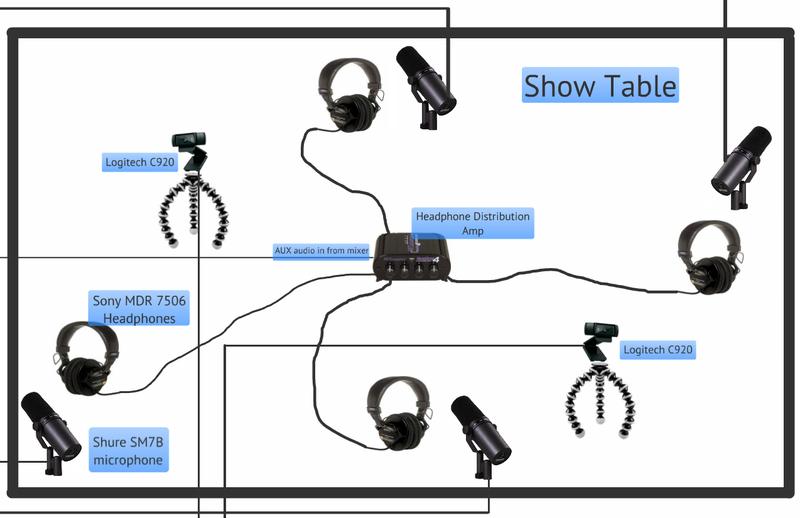 Connect the microphones to the mixer inputs via XLR cable. For best results, use a pop filter to reduce unwanted pops from "p" and 'b" sounds. This stand is quiet, flexible, and rotates 360 degrees for optimal placement. Pro-quality headphones that are comfortable and work well in many applications. Each pair should be connected to one of the outputs on the headphone distribution amp. Depending on the size and layout of your studio, you may need to use headphone extension cables to reach the distribution amp. The headphone distribution amp allows you to individually set the headphone volume for each participant, so everyone can hear themselves and each other at a clear and comfortable volume. We'll use the 1/4" to mini stereo plug cable to connect the AUX 1 Send from our Mackie mixer to the input of the HeadAmp4. 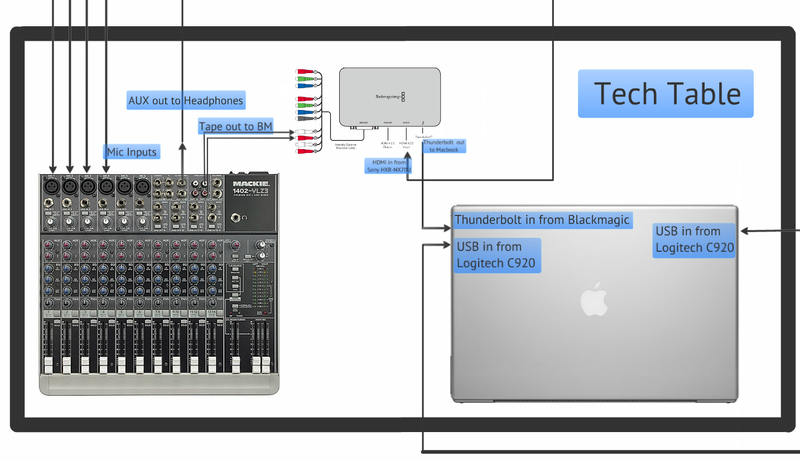 With this configuration, the studio engineer can connect his own microphone to the Mackie and send it through AUX 1 so he/she can talk to the participants through their headphones without being picked up in the broadcast and recording. An absolute bargain for the quality, these HD USB cameras are great for Ustream and work especially well for stationary shots where zooming and panning aren't required. Depending on how far you position the Logitech camera(s) from the computer, you may need to use USB extension cables. These versatile tripods are great for a tabletop and have fully adjustable legs that can be positioned for a level camera shot in almost any situation and even wrap around poles or other objects. 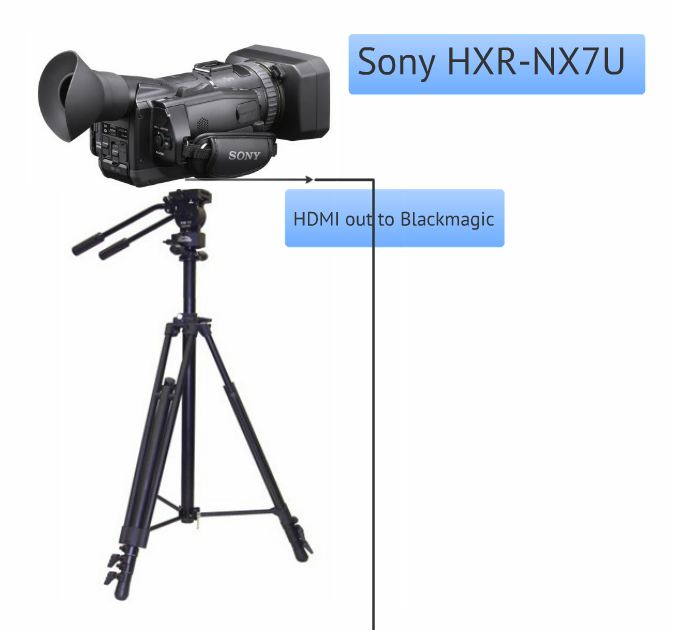 Professional, easy to use HD camera with great picture quality and ultra wide lens. Connect the camera's mini-HDMI output to the HDMI input of the Blackmagic Intensity Extreme. The camera comes with a mini-HDMI to HDMI adapter, but if possible, we'd recommend using a single cable with mini-HDMI on one end and standard HDMI on the other. A professional, yet affordable tripod with a fluid head, 2 pan handles, and a 10-year warranty.